Tuesday report | Carnahan & Sons, Inc. The summer daily work continues. Brandon is delivering 5 truckloads of wheat this week to ADM in Newburgh, Indiana. John is monitoring the soybeans that remain to be sprayed… and developing a plan to spray an application of Roundup. Although some need the sprayer this week, several fields will wait quite a bit longer… those that have no johnsongrass emerging from the soybean crop canopy– good news! 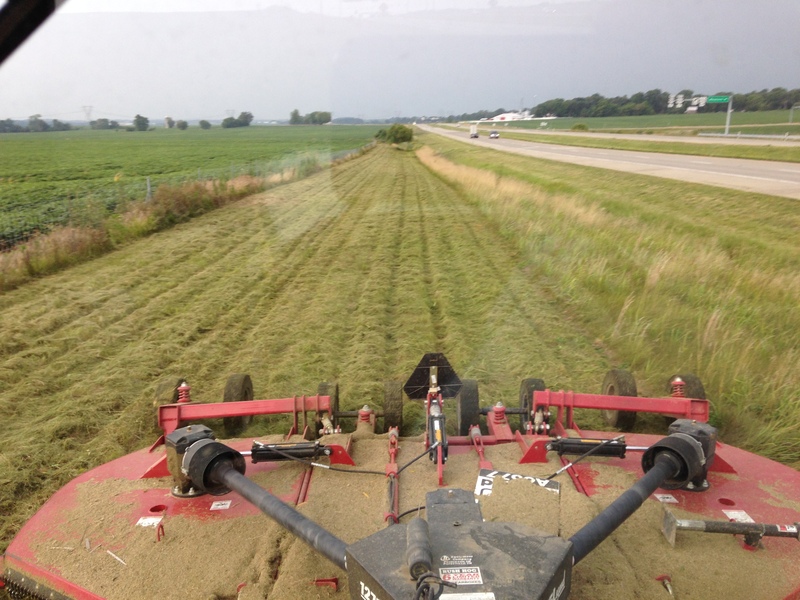 I have been working on the roadside mowing, using the JD 7130 tractor and the bush-hog cutter. Mowing along US 50 just outside of Wheatland, Indiana. This location is a priority, for the community is hosting its annual “Wheatfest” this weekend. The state does not mow nearly as much as they did in the past. Also mowed was the levee at the Burke farm. The new fescue there is getting established quite nicely. We still have a few days’ worth of roadside mowing to be done with the bush-hog. I hope it is complete by the weekend. It just makes the fields look more presentable, like someone is actually paying attention to this detail. 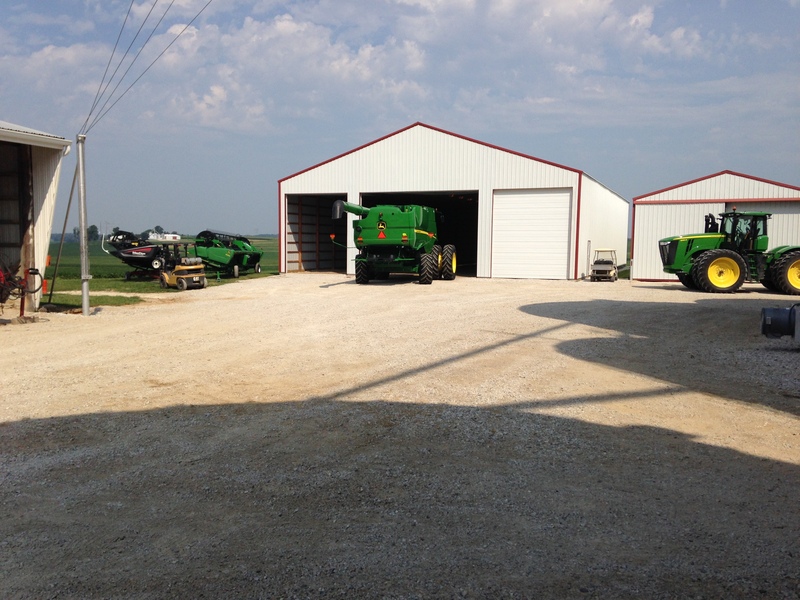 Yesterday afternoon, after the preparation work was finished on the new Demco grain cart, we re-arranged all the stuff in the big storage barn to accommodate the new cart. We like for our ‘stuff’ to be stored inside, out of the sun. Many of our field locations near a well-traveled road have been marked by our seed dealer to indicate which variety of soybeans or corn is growing there. It is a popular thing to place this signage along fields… it’s a form of farmer advertising. These signs just seemed to spring up overnight! 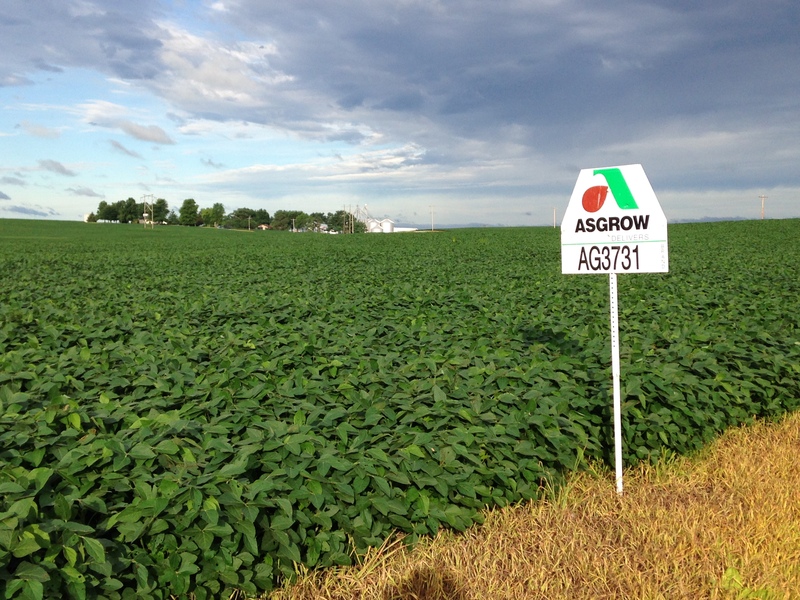 As anyone who drives by can now see, our Mailbox field has Asgrow AG3731 soybeans growing in it. You can see our main farmstead in the background. A good inch rain would be welcome.. it looked this morning like we were going to get it, but it passed us by. We cannot detect any drought stress in our crops yet, but a nice rain would be a happy thing. In reality, most of the crop looks pretty good. Corn at Lett and Watjen, of course, is smaller because of the later planting… but the last-planted field did make the old adage of “knee high by the 4th of July”! Almost every other corn field is in tassel stage… and boy, oh boy… the corn has that sweet aroma that comes during pollination. This entry was posted in Farm Days, News and tagged ADM, ADM Newburgh Indiana, bush hog, Demco grain cart, JD 7130 tractor, roadside mowing, WheatFest, Wheatland Indiana. Bookmark the permalink.